Many teenagers experience acne, but this condition can also affect adults. Even more frustrating, a treatment that worked during adolescence may not work for someone as an adult. It might even make the acne worse. Like acne during the teenage years, adult acne is caused by bacteria that grow in a clogged pore, which leads to pimples and inflammation. It can occur not just on the face, but also on other areas of the body like the chest and back. Changing hormone levels. When the body’s hormones are out of balance, acne can form. In women, this can happen near their periods, while pregnant, during menopause, or when starting or stopping birth control pills. Stress. Stress may cause acne to flare up. This may be a result of certain hormones that are produced when stressed, which stimulate the hair follicles and oil glands in the skin. Family history. If one of your close relatives has or had adult acne, you may be more likely to get it, as well. Hair and skin care products. Certain chemicals in these products may make adult acne worse. To prevent flare-ups, look for products that have one of these terms on the label: non-comedogenic, non-acnegenic, oil-free, or won’t clog pores. Medications. Some medications can cause adult acne. If you think one of your medications is causing your acne or making it worse, ask your doctor. Don’t stop taking your medication without talking to your doctor first. Medical conditions. Certain medical conditions can cause adult acne. 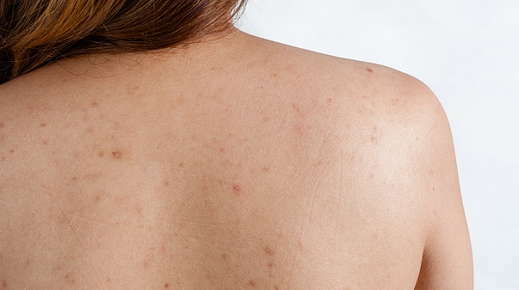 The acne may go away once the medical condition is treated. If you think this might be the case, talk to a doctor. Medications. A dermatologist may prescribe a medication, either oral or topical, to reduce your acne. This includes drugs that reduce the effect of hormones on your acne. Your doctor may also recommend over-the-counter medications, such as salicylic acid. Healthier diet. Eating a well-balanced diet rich in fresh fruits and vegetables and lean sources of protein may reduce your acne flare-ups. This includes eating fewer refined or processed carbohydrates, cutting back on dairy, and reducing your intake of sodium. Blue light therapy. Also known as photodynamic therapy, this treatment uses a special blue light to kill the bacteria that cause acne. This treatment is offered by dermatologists. It can cause temporary redness. Tea tree oil. This naturally-occurring oil has antiseptic properties that may kill some of the bacteria that cause acne. It is available in skin washes, soaps and topical solutions. Reduce stress. Since stress can make your acne flare-ups worse, learning how to manage stress may help. Many activities can help calm your nerves, including meditation, exercise and yoga. For help in choosing facial cleansers, moisturizers and cosmetics that are gentle on your skin, talk to your skin care professional. Your esthetician can also give you tips on the best ways to wash and care for your skin so you can minimize acne flare-ups.